Dynamic torque transducers with sliprings and rotating contactless torque sensors are designed to measure dynamic torque, rotation speed and angle in rotation finding applications in production monitoring, quality assurance and laboratory research. Furthermore, the combination of torque sensors and DIN standard couplings corresponds to power density and market requirements that ensure the long-lasting high performance of the torque sensor. Next to various keyway hubs, tension rings and clamping hubs, a flange connection and 6 different shaft-hub-connections are available. Rotary torque transducers ranging from 0.005-20000 Nm with high accuracy and quality are the ideal choice for dynamic torque measurement. 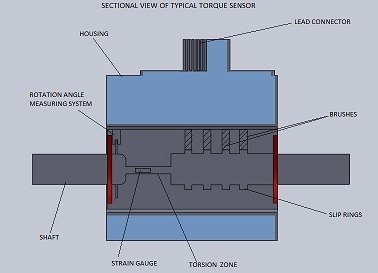 A typical torque sensor uses a load cell to covert force into measurable electrical output. A load cell contains one or more strain gauges. These are components whose electrical resistance changes when they are affected by a physical force. The obvious difficulty in measuring torque is that, by definition, torque is a feature of rotational systems. Therefore, electrical connection between rotating and stationary parts has to be made to power the strain gauge bridge applied to the rotating shaft as well as to receive signal from the shaft. The method most commonly used to do so is the slip ring. A slip ring has two components. The first is a series of conductive bands that are positioned around the rotating element of the assembly. The second is a group if stationary brushes. Even as the ring rotates, it is kept in permanent contact with the brushes, thus, allowing the transfer of electrical power and sensor signal. A more recent development is the use of SAW (Surface Acoustic Wave) torque sensing technology for non-contact rotating torque sensors which will be introduced more on the High Speed page. Torque Transducers with sliprings and contactless rotary torque sensors with a final torque measurement range from 0.005 Nm up to20000 Nm are available in a wide variety of connection options: shafts with keyways, square drives, and hexagonal drives; both ends shaft, both ends flange and combination of shaft and flange ends. A speed-/angle- sensor integrated in the torque dynamometer is available for many rotating toque cells. For more details pleases visit here. Please complete the enquiry form below for specific information and advice on Rotating.